Simões dos Reis, Verusca, Riggio, Adam and Simbürger, Elisabeth. 2012. “Does the Public University Still Exist? ” Social Epistemology Review and Reply Collective 1 (3): 14-17. A Manifesto for Resistance London: Pluto Press. John Holmwood (ed). 2013. A Manifesto for the Public University London: Bloomsbury. Does the Public University Still Exist? 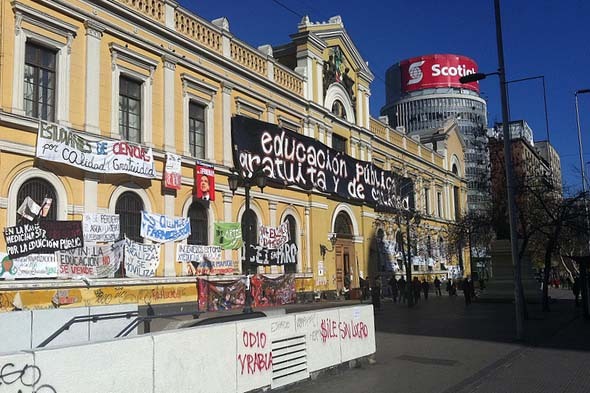 Over the last eighteen months, sparked by intense student protests in countries such as the UK, Austria, Italy, Chile, Colombia and the US, interest has been renewed in the debate over the future of the public university. In the UK, triggered by the austerity period and the complete restructuring of universities, the ranks are formed to defend the public university (Bailey and Freedman, 2011; Holmwood, 2011). However, as New Public Management has transformed previously public universities and private universities find themselves on the fore march globally, the question remains whether the public university is nothing else than a remote, nostalgic memory. In the following, three debaters from the Social Epistemology Review and Reply Collective – Verusca Simões dos Reis, Adam Riggio and Elisabeth Simbürger provide their answers to the question whether the public university still exists. Bailey, M. and Freedman, D. (eds.) 2011. The Assault on Universities. A Manifesto for Resistance. London: Pluto Press. Holmwood, J. (ed.) 2011. A Manifiesto for the Public University. London: Bloomsbury. The Public University: Producing Knowledge As A Public Good? My straightforward answer to the question whether the public university still exists would be: it depends. It depends on whether one thinks about the nature of funding or knowledge. Either way they are connected. Looking at public and private funds globally, public funding has experienced severe cuts over the last decades. However, taking on board some of the criticism against the generalizing, universalizing tendencies in the social sciences, we should rather look at local practices (sees Adam Riggio’s text for the U.S.A. case). In the following, I will focus on the academic mode adopted in Brazil. Despite local differences, there is some basic common ground about the original idea of the university, i.e, the task of forming people and scholars and of producing knowledge. This model of university as teaching and research goes back to Wilhelm von Humboldt in the 19th century. According to Weber, much of the academic tradition of producing knowledge socially and in a public way (expressed in Humboldt’s ideals) had collapsed due to the capitalist tradition in American universities. Although there has been much influence of the American model on Brazilian life and culture, until some years ago the university had been a place of résistance. Due to the strong dependency of grants from the government, universities in Brazil are usually public funded. Private universities do exist but the best research – public knowledge –. is considered to be produced in public universities with public funding. At least this was the case until a couple of years ago, until the partnership between university and industry got more serious. The interaction between public university, industry and the government has developed based on the rhetoric that innovation will be a solution to all sorts of needs of public universities. But the “marriage” between public and private funds is only the tip of the iceberg to a larger problem that has been discussed worldwide at least since 1983, i.e., a change in the academic culture and in the way knowledge is produced and scholars evaluated. Some scholars, such as the physicist and epistemologist John Michael Ziman F.R.S (1925-2005), have pointed out that the incorporation of managerial principles in the norms of academia changes its whole culture. Today, knowledge seems to be synonymous with market driven and instrumental research. Nevertheless scholars have been evaluated differently than in the past, with increasing pressure to publish results (sometimes even before getting them) and more administrative duties to the detriment of what their vocation ought to be: managing their own research and helping people to understand (and possibly change) the world. So, public universities might cease to exist not only because they may not be publicly funded anymore, but mainly and more seriously because the incorporation of managerial ethos in academic practices might, in the long term, kill the public nature of knowledge. Despite the large number of universities in North America that can be called public, thanks to their government funding, I doubt if it is appropriate to discuss universities this way anymore. I understand public as an answer to the question of who a university is for. Most readers of social epistemology scholarship work in universities as professors, or aim to do so. Our work concentrates on research, the advancement of an academic discipline. But the majority of people on a university campus are not faculty and researchers. They are students, who come to a university to develop the skills and habits of thinking to help them build careers. If a university has a public, this is it. The research and the institution should have one aim: an educated, free thinking populace. The financial burden of education in public universities in North America constitutes the greatest social burden to potential students. There are many resources for financial aid to attend universities whose tuition is upwards of $12,000 per semester. Some of these resources are loans, forcing young people into severe debt. If we have learned one thing from the past four years, it is that extreme debt is no way to live. There are also options of government grants, which do not have to be repaid, and are available to many students in the United States (far fewer non-loan programs exist in my own country, Canada). If government offers grants, and government funds universities, there is no reason why the budgets of universities themselves could not absorb this money by reducing student fees to reasonable levels. It would make no budgetary difference to the taxpayer, and would reduce the barrier preventing the modern university from being genuinely public. High tuition fees show young people that there are penalties and barriers to earning a university degree. Such high entrance fees and the prospect of heavy debt may not reduce accessibility in a literal sense: anyone can jump the bureaucratic hoops of loans and grants, or accept the debt burden for an education. But these burdens are incidental to the genuinely difficult work of earning an advanced education: classes, lab work, writing, developing one’s thought. When the burdens of a project are incidental to the project itself, for many people the project is not worth the extra burden. Such a burdensome institution can no longer call itself public. The public university still exists, albeit it has changed substantially over the last few decades. I would argue that not only neo-liberalism – ‘the market’ – is to blame for the increasingly precarious state of the public university. What is more is that the social sciences and humanities that engage in research about the university also have a role to play in how a lot of the discourse about universities is run: by having created and employed empirically misleading terminologies such as the hybrid or postmodern university. As a consequence of the implementation of New Public Management, these days even public universities incorporate business models and function like Ltds. Common terms in Higher Education studies such as ‘the marketization of Higher Education’ refer to the public sphere having been colonised by the market. Some take this as an argument for why the current reality of universities can no longer be captured using the dichotomy of the public and the private. Rather, hybridity would be a more apt description of the status quo in Higher Education (Lowrie and Willmott, 2006). Social epistemologist Steve Fuller argues that the promotion of knowledge as a public good irrespective of the public or private status of a university would be more important than sticking to the old discussion of public and private universities (Fuller, 2003). Both arguments are tricky for similar reasons. They tend to disguise the underlying mechanism for the so-called blurring boundaries between the public and the private: capitalism. Just to be clear: This is not to idealize the notion of the public university in a romantic fashion or to be in nostalgic denial of the many changes that have taken place over the last decades. Yet, by replacing the dichotomy of public and private universities with new terms such as hybridity, the commodification of education merely gets a new, seemingly fashionable name. However, ambiguity in terminology is unhelpful or even dangerous when employed to make empirical phenomena invisible. To what extent the public university still exists is another matter but first of all the social sciences need to rethink their terminology. Fuller, S. 2003. ‘Can universities solve the problem of knowledge in society without succumbing to the knowledge society? Policy Futures in Education 1 (1): 106-124. Lowrie, A. and H. Willmott. 2006. ‘Marketing Higher Education: the promotion of relevance and the relevance of promotion’. Social Epistemology 20 (3-4): 221-240. Nederveen Pieterse, J. 2001. ‘Hybridity, So What? : The Anti-Hybridity Backlash and the Riddles of Recognition’. Theory, Culture and Society 18: 219-245. I am a sociologist, currently based in Santiago de Chile. Chris Hedges’ Death of the Liberal Class (2010) is a criticism of academia, but also the Democratic Party, churches, unions, and the media. He argues that these organizations, at least to some extent, once defended the working class and the poor, but that they have abandoned this mission, and have contributed to the creation of a “permanent underclass” of Americans. Nevertheless, I believe that Hedges is correct in this sense: academia, the Democratic Party, Churches, unions, and the media have withdrawn much of the organizational support they once provided to professors, politicians, clergymen (and women), union members, and reporters who spoke out in defense of workers and the poor. Part of Hedges’ argument is that there was a time in which liberals served as the bridge between the more radical left – communists and socialists – and the more respectable left. But the successful suppression of communism and socialism in America has eliminated the “bank” from which the liberal bridge could stretch out to mainstream political life.